It's near San Antonio, and it's in the "hill country" of Texas. Spring is a great time to go there, because there's an abundance of wildflowers...especially bluebonnets- The Texas state flower. We saw them all along the highway. and Ricky's pretty excited about ALL of it! She also got me this Hello Kitty hat, but Fermin took a liking to it, so I guess it's his now. And that's okay with me... He looks pretty irresistible in it I think. Hubba Hubba! And THAT sounds like a perfect weekend to me! Although I have watched many past seasons of American Idol, I stopped several years ago. It got less and less exciting to me as the years rolled on. There was nothing that could match up to that first year, when none of us really knew what to expect. And, that first season's winner,...Kelly Clarkson. I remember how week after week, she just kept blowing everyone away with that voice! I wanted her to win from the very beginning...and she did! I know she's gone on to be a big success, but I haven't really followed her career too much. I kept seeing people's post on Facebook about her performance on American Idol last week. And last night, a friend told me about the song. As she was telling me about the lyrics, and their meaning, she got a little teary eyed. So, I decided to finally check out the video of Kelly Clarkson singing her song, "Piece by Piece". It's a great song, sung by a beautiful and powerful voice. But, for me anyway, more than anything, the reason Kelly Clarkson's performance brought me to tears was because of her emotional response to the song while she was on stage, in front of the world. People always apologize for crying in public. (And in private!) You can even hear Kelly say "I'm sorry", during and after this performance. But that kind of true expression of vulnerability is what connects us so deeply to another human being, whether we know them or not. Often times, we end up crying with them, and then we're in this experience of deep emotion together. And so, it's really nothing to be sorry for. It's a beautiful and human thing. So get out your Kleenex. And enjoy being human. Being a Texan on Super Tuesday felt so defeating. And although I read and like to believe that "My Vote Counts", the truth is, it doesn't. I live in a Republican state... and it's looking more and more like Trump will be the Republican candidate. And that is totally embarrassing. But hey, wait! I'm a Democrat. But in Texas... that counts for just about nothing. 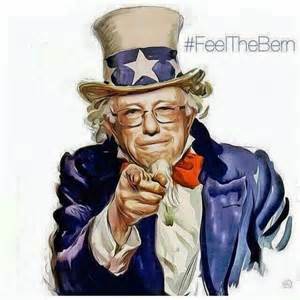 Listening to the media today, they're making it sound like Bernie doesn't have a chance- that instead, it will be Hillary Clinton running against Trump. And of course, I will get behind Clinton if and when it comes to that. But can we please not count Bernie out just yet?! C'mon! Please just listen to him- He could make a real difference. And it would be a positive one, unlike what Trump could do to our nation. I don't like to talk politics, and I seldom do. But I just had to express my disappointment today. I'm still feeling the Bern.